Dodge Charger Pursuit is going tactical in a big way for 2016, offering the heroic men and women who protect us with the all-new, and segment's largest, Uconnect 12.1-inch built-in touchscreen that enables a segment-exclusive integration of law enforcement computer systems with the easy-to-use and award-winning Uconnect touchscreen system. Segment-first integration of law enforcement data systems with 2016 Dodge Charger Pursuit's field proven, easy-to-use and award-winning Uconnect touchscreen system. Designed for police use, Uconnect's familiar and intuitive interface allows for quick toggling between vehicle controls and nearly every plug-and-play police-designed computer system. Uconnect 12.1 is more than five times larger than Dodge Charger Pursuit's standard Uconnect 5.0 system. Segment's largest Uconnect 12.1-inch touchscreen built-in to Dodge Charger Pursuit's instrument panel helps law enforcement officers keep their eyes on the road, not to the side. Focus on safety and security: unlike third-party solutions that require a bulky console-mounted computer screen, all-new Uconnect 12.1 does not obstruct front-driver and passenger air bags or interfere with occupant space. Tactical equipment: Uconnect 12.1 undergoes Dodge Charger Pursuit's rigorous field testing and engineering requirements, and is backed with a 3-year/36,000-mile factory warranty. Available through FCA Fleet Operations, the 2016 Dodge Charger Pursuit with Uconnect 12.1 touchscreen display will be available for ordering in January, with production starting in March. "As America's high-performance police vehicle, Dodge Charger Pursuit is going big for 2016, offering a massive, Uconnect touchscreen system that streamlines a law enforcement officer's computer system with our easy-to-use Uconnect system – on an all-new laptop-size 12.1-inch touchscreen display," said Tim Kuniskis, President and CEO - Dodge and SRT Brands, and Vice President - Fleet Operations, FCA - North America. "Designed and tested to Charger Pursuit's stringent test requirements, our all-new Uconnect 12.1 system is the latest piece of tactical hardware that is neatly integrated into the instrument panel for a mobile command center that could only be delivered from Dodge." Designed exclusively to give law enforcement officers the upper hand, the all-new Uconnect 12.1 touchscreen system provides a fully integrated and exclusive approach to Dodge Charger Pursuit's mobile command capabilities. Compared to the Dodge Charger Pursuit's standard 5-inch display, the all-new Uconnect 12.1 features a 12.1-inch high-resolution touchscreen display that is more than five times larger in the center of the instrument panel. Uconnect 12.1 is ergonomically located and provides a large 1024 by 768 pixel display of Uconnect radio and vehicle controls, as well as the ability to toggle to a law enforcement officer's computer via a menu bar at the top of the screen. Designed for ease of integration and operation, the Uconnect 12.1 features a plug-and-play solution (Ethernet) to connect an officer's mobile computer out of sight in the Dodge Charger Pursuit's trunk. Uconnect 12.1 was also engineered and tested to work with an officer wearing gloves, plus extreme operating conditions as low as -40°C and as hot as 85°C. For added upfit equipment control and capability, the 2016 Dodge Charger Pursuit's Uconnect 12.1 also provides a fourth auxiliary button, adding to the three steering-wheel mounted auxiliary buttons managed through the Vehicle Systems Interference Module (VSIM). This elegant wiring solution makes installation of upfit equipment easier, as the system is capable of providing the appropriate power, ground and fusing for a variety of LED, lighting, siren, computer, modem or camera systems. The development of the 2016 Dodge Charger Pursuit's all-new Uconnect 12.1 touchscreen system was a team effort, combining the expertise of Fiat Chrysler Automobile's law enforcement vehicle design, engineering, fleet and Uconnect teams, plus its 19-member Police Advisory Board (PAB) to answer the call for an integrated mobile command center solution. Safety and security are the top priority when designing new tactical equipment for the Dodge Charger Pursuit. Uconnect 12.1 was conceptualized from the vehicle's team of law enforcement specialists, as well as feedback from the field. Advancements in law enforcement have put highly effective new tools in the hands of police. Laptop computers with data protection protocols have replaced two-way radios for the transmission of sensitive information, such as crime scene details and suspect identities. Police vehicles are jam-packed with additional displays, mounting brackets and keyboards that not only compromise comfort, they pose a risk to officer safety in the event of a collision. Initial feedback found that a traditional, center console-mounted laptop or screen positioned between driver and front passenger often added dangerous impact points or could even interfere with airbag deployment during a crash. In addition, these third-party upfit solutions were considered distractive to the officer's outward vision and line-of-sight. Last, the ergonomics designed into the vehicle's controls and even touchscreen displays were hindered by the installation of these bulky devices. 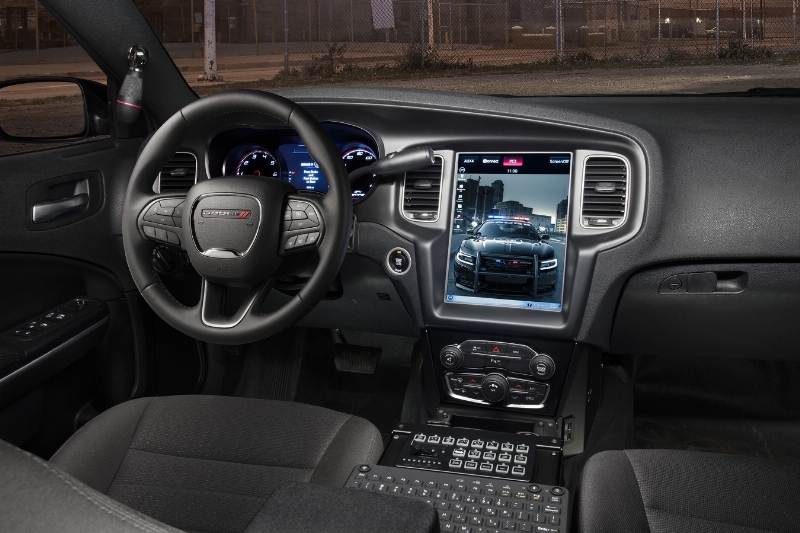 The Dodge Charger Pursuit's team of law enforcement specialists saw a clear opportunity to adapt the easy-to-use Uconnect interface for the benefit of police officers and their mobile technologies. In 2012, the team provided Uconnect 12.1 system prototypes in the Los Angeles Police Department's Dodge Charger Pursuit test vehicles. And now, the all-new Uconnect 12.1 system is ready and available to all 2016 Dodge Charger Pursuit customers. The all-new Uconnect 12.1 leverages the strengths and continued improvements of the Uconnect touchscreen family. Innovative features on the segment's largest touchscreen include, Bluetooth connectivity for mobile devices, Bluetooth streaming audio, ParkView rear back-up camera, SD Card slot, plus USB and auxiliary ports. "As technology continues to evolve, the next wave of Uconnect features and services is in constant progression and our latest Charger Pursuit application with our massive 12.1-inch touchscreen display is just a taste of our in-house capabilities to expand and integrate different technologies for our customers," said Joni Christensen, Head of Uconnect Marketing. "This is a great opportunity to adapt our easy-to-use Uconnect system to benefit law enforcement officers, making it even easier to keep their hand on the wheel and eyes on the road." Uconnect 12.1 is introducing new features that include the all-new Drag and Drop menu bar, Siri Eyes Free and Do Not Disturb features, which can be viewed via the 12.1-inch touchscreen. Drag and Drop Menu Bar: Dodge Charge Pursuit customers now can simply drag their favorite feature or service icon from the apps menu and move them to their Uconnect system's main menu bar. Siri Eyes Free: Via the voice button on the steering wheel and compatible with an Apple iPhone 4s or later, with Siri Eyes Free drivers can speak natural language voice commands to send text messages, play music, set reminders, place phone calls and access turn-by-turn directions. Drivers simply push and hold the voice recognition button on the steering wheel until the Siri Eyes Free screen appears on the touchscreen and they can hear the audible tones. Do Not Disturb: Drivers of the Dodge Charge Pursuit who prefer not be interrupted with phone calls or text messages while driving can choose to turn on the new "Do Not Disturb" and "Reply with Text Message" feature. Located within the Uconnect system's phone screen, once enabled with the push of a button or via voice command, the Do Not Disturb icon will route all incoming mobile calls to voicemail and suppress text messages. If the driver chooses to enable the Do Not Disturb feature, they also have the ability to send a default or customized response once a call or text message is received. Dodge brand recognizes that the heroic men and women who protect us must be equipped with the best-performing pursuit-rated vehicle, loaded with tactical equipment and technology. And for 2016, the Dodge Charger Pursuit – America's high-performance police vehicle – delivers with world-class safety and security, technology and pursuit-rated hardware, all while offering 370 best-in-class horsepower, factory-installed Mopar upfit packages and the segment's most advanced all-wheel-drive (AWD) system for maximum tactical performance, all-weather traction and fuel-efficiency. 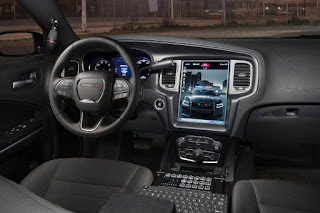 0 comments on "New 12.1-inch Touchscreen Combines Police PCs and Uconnect Technology on 2016 Dodge Charger Pursuit"